Elsie M. Campbell and Aunt Mimi's Quiltworks: Eleven States in 21 Days! Eleven States in 21 Days! FINALLY! A new blog! Were you wondering where I went? First, there were pressing book deadlines (String Quilts went to press this past Monday.) Then there were trip preparations. (I'm in Columbus, Ohio for National Quilt Association's annual quilt show.) Then there was the actual trip. I started off driving to Little Rock, Arkansas for the QUEST quilt guild's meeting and a workshop on Monday June 8. The little ol' Impala seemed to be working great, then Ken called. There was an emergency recall, the first during the 4 years I have owned this lovely car. So, first thing Tuesday morning I found a GM dealer to make the needed alterations so that I could proceed safely on my way. On the way to the dealer I noticed road signs about the historic LR Central High School where Governor Faubus and others faced the National Guard when 9 courageous high schoolers attempted to integrate the high school in 1957. A side trip was in order. I found the historic site and museum with no trouble. I just got goose bumps as a read and viewed more about the events of that time. I remember, as a child, watching all the happenings on our new television set, with Daddy trying to explain things in ways appropriate for an 8 year-old child to understand. I remember being upset, and asking why those people were all so angry with each other, and not understanding the importance of those events. Visual images tend to remain much longer in my brain than other things, and the school looked strangely familiar and brought back memories of those television images. From Little Rock, I drove through Memphis and Nashville, to Smyrna, Tennessee for the Tennessee Valley Quilter's Guild Bi-Annual Retreat. The quilters there were delightful! I had such a good time presenting a couple of workshops and a lecture to great people. Remember the Cubic Stars step-outs from my lasts May blog? The class worked very hard, and most got a portion of the center done, but alas! There was simply too much information and things to stitch for a one-day class! Lesson learned. I'm going to have to re-think whether this will make a good workshop, or maybe it would be better as a multiple day activity, like at a retreat, or for a series of classes. On to visit Ken's brother and sister-in-law in the Huntsville, Alabama area. 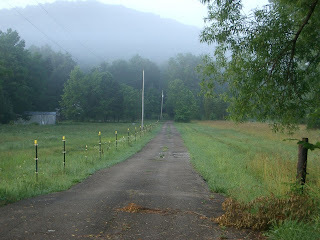 On the way, I missed my first exit off of I-24 and ended up driving through some of the most fascinating countryside. 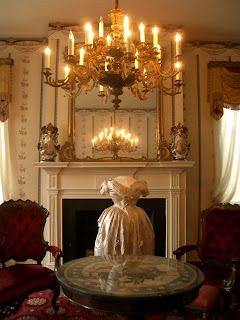 Antebellum mansions from pre-civil war era with tree-lined drives, and Tennessee Walking Horse stables and pastures with mares and new foals made for a beautiful drive. Had it not been raining, I would have liked to stop and take photos. 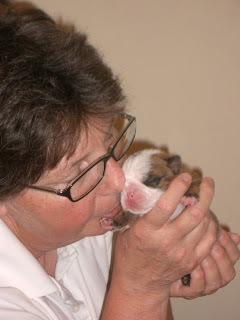 When I arrived, I was not a bit surprised to find that Keith and Carol are now breeding and showing registered Bull Dogs. The most fun of all was watching a litter of 5 brand new puppies. What most amazed me was all the trophies, rosettes, and picture books of awards their dogs have won. Check out the Avalon Bull Dogs website! Then I drove through 4 states in one day. From Alabama, through Tennessee, Kentucky, and stopping for a couple of nights on the In diana side of the Tennessee River across from Louisville. On the way I did a side trip to Columbia, TN and visited the ancestral home of James K. Polk. Of course, being a quilter by trade, I was most fascinated by the heavily trapuntoed whole cloth bedspreads, and the First Lady's inaugural and other gowns. A quick visit to Louisville, Kentucky included a wonderful, but brief visit with Mary Andrade-Carlson, her delightful children and neice from Colorado, Izzie. Mary's mother Sandy happens to be the quilt teaching who first put a rotary cutter in my hands! Since the weather was threatening to turn a little nasty, Mary decided much to my agreement, that we should do a driving tour of a few sites in the Louisville area. 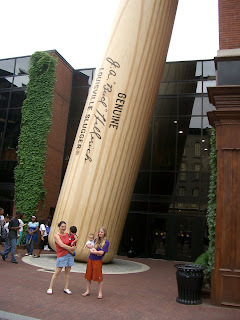 First, we stopped and watched glass bl owing in progress, a took brief walk-through of the Louisville Slugger factory (Yes, I used to be a softball player, and I sometimes follow baseball, mostly of the Philadelphia Phillies.) 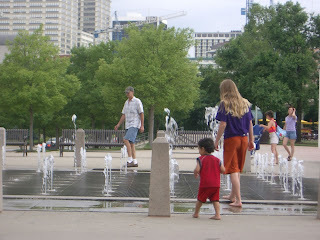 Then on to the waterfront, where the play in a fountain was interupted by a thunderstorm. I was privileged to hold little Sandra (named after her grandmother) all through dinner, but I had forgotten how long of a reach 8-month-olds have. A bit of my Fettucini Alfredo ended up in our laps, but it was worth it to get to hold such a happy, sweet little one. Today was not a very long drive, but bumper-to-bumper freeway driving is not much to my liking. I prefer the wide open spaces, but today was Cincinnati and Columbus. I found my hotel, no problem, but getting there from the lane in which I found myself was not going to happen. And then there were unfamiliar one-way streets, and then several tiers of highways, and I went around in circles a few times until I found the right lane going the right direction. WHEW!!!! But I'm here! Tomorrow's class still needs a little polishing, so I've gotta get back to work. More photos to follow, if I can find a spare minute or two to actually see the show.